Here’s a familiar scenario: It’s 2 a.m. and you hear your little one crying out for you… again. You’re out of bed and in her room, soothing her back to sleep. This is the 15th night in a row. 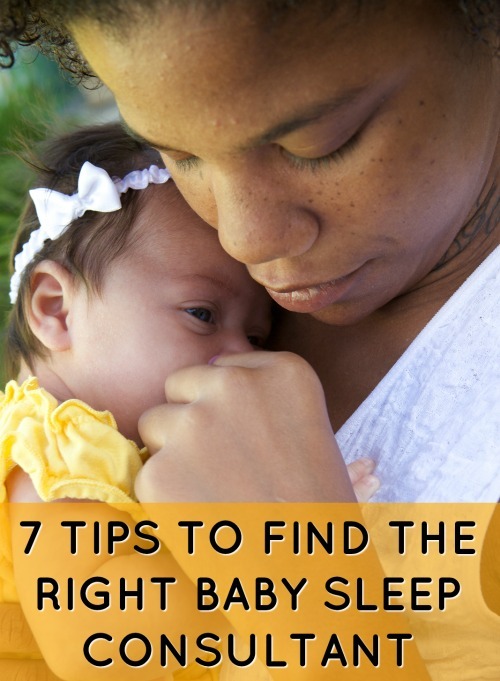 You’ve tried everything, but nothing you do is earning you or your baby a full night of rest. How are you ever going to get through yet another day of work on just a few hours of sleep?? Sound familiar? If so, then it might finally be time to hire a baby/toddler sleep consultant to make your life easier. Now, don’t get me wrong; as parents, we are smart, we know our kids, and we are certainly capable of solving many of our children’s problems on our own. But there are plenty of baby-related challenges that we don’t handle ourselves. You take your child to a doctor when she’s sick, you likely send your child to school when it’s time to learn…and, in many cases, it’s a good idea to bring in an expert when it’s time to help your child sleep better. After all, with all that’s on your plate at work and at home, there is simply little time left to read another baby sleep book that contradicts the last. Why not hire a person who has already done the reading and research, has worked with tons of parents and can give you the sleep solutions you need? Just call her your CliffsNotes for your baby or toddler’s sleep! What Should You Expect When You Hire A Baby or Toddler Sleep Consultant? There are a lot of sleep consultants out there, and many of them offer different kinds of products and services. That said, at minimum, you should expect the following when you hire a sleep consultant. You should receive a plan that’s truly personalized to meet your family’s unique needs. Any unique challenges your family faces, or any unique factors pertaining to your baby’s health and overall development, should be reflected in the plan. And, will the plan be thorough like a Personalized Sleep Plan® from The Baby Sleep Site®? Not all “sleep plans” are created equal. Ask for a sample! Your consultant should work with you for a pre-determined period of time to implement the plan and to make changes to it as needed. Your plan will be far more effective if your consultant helps you implement it; a good consultant will not only give you a plan, she’ll also tell you how to put it into practice at home and work you through it. Your consultant should be available for follow-up questions and concerns that may arise both during and after sleep training. Even after your consulting session has expired, you should be able to follow-up with your consultant later for additional help as needed. Your consultant should provide you with the motivation and encouragement necessary to keep you going when the going gets tough. Sleep training can be hard; your consultant should help you stay positive and motivated and focused on your end goals. Listen to word-of-mouth recommendations. Chances are you aren’t as alone as you think. With over 12,000 babies born each day in the U.S., at least half or more will have a sleep issue of some sort. You can ask one of your friends, neighbors, or co-workers to see if they have already reached out for help and can make a recommendation. Look for a match in philosophy and background. Would you rather talk to a person with a medical or clinical degree? Or, would you prefer to talk to another mom who has similar experiences and is also a consultant? Or someone in between? Some pediatricians have focused a lot on baby sleep, but most haven’t and receive just a few hours of training. And, many doctors are quick to prescribe the cry-it-out method, which may go against your philosophy or not fit with your baby’s personality or temperament. Another mom might understand more what you are going through. Before you hire your sleep consultant, make sure your philosophy matches their process. Does this consultant seem caring and compassionate? Your sleep consultant should care about you and your baby, not just in the results. If they simply want to bark orders at you without offering a listening ear, you might end up feeling like they aren’t truly in tune with your family’s needs. Is this consultant realistic about outcomes? Does he or she say your baby will sleep all night in just three days, no matter what? Does that sound too good to be true? Sure, some babies will, but many won’t. Make sure the sleep consultant sets realistic expectations. Does your sleep consultant have a solid team behind her? Deciding who will be a part of your village is an important decision. If your sleep consultant isn’t very experienced, it’s important she has a senior sleep consultant with which to consult on more difficult cases. In addition, if she’s sick or goes out of town, you want to know you will still have someone to call upon. Furthermore, some sleep consultants have varied backgrounds such as lactation consultant, special needs, etc. At The Baby Sleep Site®, for example, our sleep consulting team is made up of lactation consultants, licensed social workers and professionals with medical, nutrition, psychological and early intervention experiences, to name a few, so we all often collaborate on more complicated or challenging family situations and are able to help each other’s clients in case one of us is sick or on vacation. And, finally, does your sleep consultant have enough experience? There are many sleep consultants out there now, which wasn’t the case several years ago. Some sleep consultants are training brand new sleep consultants as part of their business model. This is great in terms of families getting more sleep, however, it is our strong belief that without more than a few hundred hours of training, all sleep consultants are not ready to take on all types of sleep problems. When we (The Baby Sleep Site®) train a new sleep consultant, for example, they undergo months of training, ongoing oversight, regular quality and performance checks, and continuing education. With having helped over 30,000 families worldwide, this allows each of us the ability to pick up on red flags or know how to solve more complicated situations due to our experience and that’s extremely important. In a time of outsourcing, it only makes sense to save your precious time by having someone help you develop a sleep plan that can work for your unique family. Rather than let another month go by while you read the books and make a plan, why not sleep that much more over the next month and give your baby the mom (or dad!) she deserves? What do you look for in a baby or toddler sleep consultant? Have you worked with a baby sleep coach before? Scroll down to share your story and to hear from other parents just like you! My wife and I have been struggling to get our newborn to sleep most nights, so we are considering going to an expert soon. I like your point about choosing a sleep consultant that has good reviews and testimonials. We’ll be sure to research a few locations online and find one that has genuine reviews.